If you have a particular design or commission in mind, or perhaps would like to explore using some of the rarer colours of sea glass that I may have in stock (for example pale pinks, amythyst and grey), please do contact me on +44 (0)7747 607929. 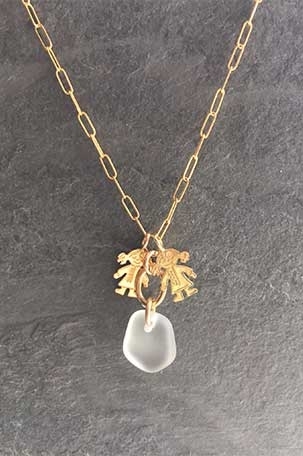 Over the last few years I have had the pleasure of making several pieces for customers, using sea glass they have found themselves to create a piece to remember a special holiday or honeymoon by, or for a special occasion or birthday. I work regularly with couples to create very personal and individual pieces for all the bridal party (from engagement rings and cuff links, through to bridesmaid necklaces and simple friendship bracelets for guest favours). Please contact me to discuss any ideas.